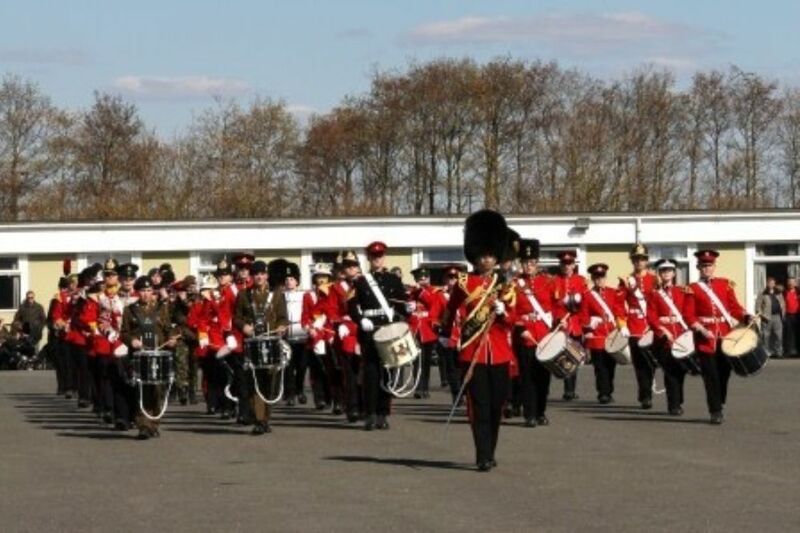 The latest week-long ACF Bands’ concentration was held at Altcar Training Camp over the Easter break. Over 500 cadets and staff from across the length and breadth of the UK (26 counties) attended and enjoyed a packed and varied programme, albeit in the character forming weather conditions the North West had to offer! Incidentally, what is meant by bands are concert bands (a mixture of brass and woodwind instruments), corps of drums and bugles platoons. In line with the ACF’s national music policy document, there were 10 courses ranging from a beginners’ course through to those for 2, 3 and 4 Star progression. In addition drum major drill and techniques were dealt with by a 3 man Regular Army Team from the Army School of Ceremonial. Adults were not forgotten with some of our number attending the endorsed Music ITC run concurrently, this time, by our Pipes and Drums cousins in Inverness, a pre-Music ITC and an Adult beginner course. The latter introduces adult staff to music through the medium of learning an instrument, thus expanding their knowledge and giving them credibility and confidence when dealing with their cadets. These camps are not exclusively just about music. About 25% of the time was devoted to other activities including archery, shooting using both Altcar’s DCCT (best shot achieved a 19 mm group) and clay pigeon facilities, Heartstart qualification and swimming. Those who had enrolled in the BTEC scheme had their needs taken care of by 2 members from CVQO who spent 2 days with us giving bespoke advice. Those enrolled in the Duke of Edinburgh’s award scheme were able to use various aspects of the camp to progress in its various categories. 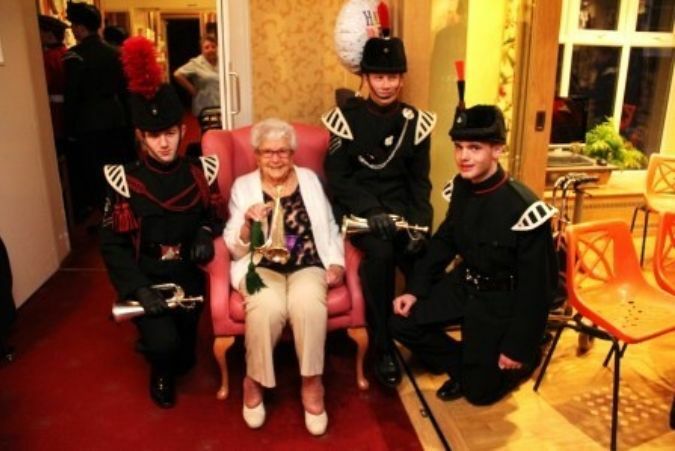 Our links with the local community were strengthened by the cadets giving concerts at Formby’s Royal British Legion and an old people’s home in Crosby. These live firing equivalents were recced and organised by those cadets as part of their respective BTEC courses and received much praise from their respective audiences for the quality of the music and the cadets’ bearing.. The final parade took place on the Thursday afternoon and we were fortunate to have Brigadier Mike Wharmby OBE (General Secretary ACFA) as the Inspecting Officer who also presented the prizes at its end. This was then followed by a short indoor concert which showcased the range of musical talents that exists plus a presentation to Brig Wharmby for his support to Army Cadet Force bands during his tenure. The camp came to an end that evening with the last night party which included the finals of the now legendary Tex Factor competition. This featured cadet acts playing instruments not played as part of the daily programme or providing other forms of entertainment. The standard has continued to rise with singer/songwriters and comedy routines to the fore as well as far exceeding the quality of the adults’ attempt to do the same 2 nights previously! Our next music concentration is at Longmoor from 20-27 October 2013. If you’re interested, book early on WESTMINSTER to avoid disappointment!